Hot peppers, including jalapenos, habaneros and ghost peppers, are a tasty addition to many recipes, and many people enjoy eating them plain. While this vegetable is a nutritious option for your meal plan, hot peppers may also have advantages and disadvantages for your stomach. Consult your health care provider about the benefits and problems associated with hot peppers. Gastric ulcers, also called peptic ulcers, occur on the inside of your stomach and can cause quite a bit of pain. While physicians believe most of these sores are triggered by a bacteria, hot peppers and other foods that irritate the stomach may also inadvertently cause them. The cells of the stomach lining produce mucus that protects the stomach from gastric acid. If the protective mucus layer is thinned, the stomach acid kicked up by eating hot peppers may create ulcers. While not one of the more common types of cancer, gastric cancer, or cancer of the stomach lining, does occur, killing over 10,000 people each year in the U.S. Eating hot peppers may play a role in decreasing your risk of this type of cancer. 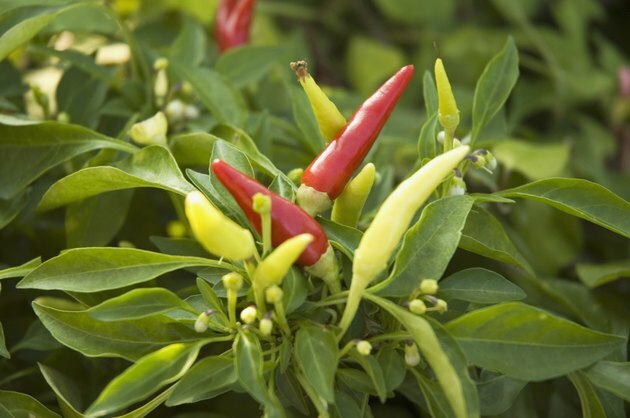 A study published in the April 2007 issue of "Biochimica et Biophysica Acta" indicates that the capsaicin present in hot peppers induces cell death in gastric cancer cells. The International Foundation For Functional Gastrointestinal Disorders reports that irritable bowel syndrome, or IBS, affects 10 to 15 percent of the U.S. population. This condition usually presents with gas, bloating, abdominal pain, diarrhea and constipation; many physicians believe stress and intestinal muscles play a role in the cause, but the foods you eat, including hot peppers, may aggravate the condition. Trigger foods vary from person to person, so consult your doctor if you experience IBS. Many people enjoy the spicy flavor of hot peppers, but eating them may trigger indigestion. Indigestion, also known as dyspepsia, can cause stomach upset or an uncomfortable feeling of fullness. Your physician may recommend antacids to relieve pain, but avoiding the consumption of hot peppers also helps you keep indigestion from occurring. Is It Okay to Eat Hot Chips During Pregnancy? Why Do Jalapenos Give Me Stomach Aches?